New Chapter Bone Strength Take Care Slim Tablets is a whole-food calcium supplement in an easy-to-swallow slim tablet. Take Care is a complete line of herbal therapeutics, each specifically formulated to support critical areas of health like bone strength, healthy blood pressure already within a normal range, and a healthy immune system, to name a few. + Adequate calcium throughout life, as part of a well-balanced diet, may reduce the risk of osteoporosis. From concept to bottle, New Chapter's products are responsibly sourced, expertly formulated, and meticulously manufactured. New Chapter tests for purity, potency and identity with independent third-party labs. Their certified organic and Non-GMO Project Verified products go through a detailed credentialing process, and their ingredients are sustainably sourced-organic Turmeric from India, wild-caught Salmon from the clean waters of Alaska, Red Marine Algae from Iceland's pristine coastline. 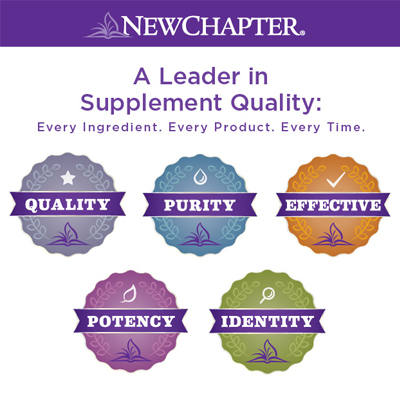 New Chapter believes the best way to deliver the healing Wisdom of Nature is through safe, effective, and high quality products made with Earth's pure ingredients. New Chapter's industry-leading quality process ensures you are getting exactly what is listed on their bottles: Every ingredient. Every Product. Every Time. Whole Food Calcium - While most calcium supplements are derived from rocks, plant-sourced Bone Strength Take Care Tiny Tabs delivers bone-strengthening calcium your body recognizes as food. Bone Health Complex - Provides key nutrients-including Whole-Food Vitamin D3-that help the body effectively utilize calcium, promote bone creation, and foster optimal bone health. Bones Not Arteries - Formulated with TargetCal, featuring Natural Vitamin K2, which directs calcium to the bones, where you need it, and keeps it out of the arteries where you don't. Promotes Joint Health - Their whole-food calcium, magnesium and 72 trace mineral complex has also been shown to promote joint health, flexibility, and movement. Easy to Digest Tiny Tabs - Delivered in an easy-to-swallow tiny tablet, and as whole food, it's easy to digest. Paul and Barbi Schulick started New Chapter in 1982, but Paul's passion for healing began as a young child while accompanying his pediatrician dad on house calls. While carrying his father's doctor bag, Paul understood that it wasn't simply the medicine that enlivened healing, but the loving care his father showed to his patients. By the early 1970's, Paul embarked on a formal study of alternative health. A love of herbs eventually led him into the natural foods retail business in 1977 and, soon after, he formalized his Master Herbalist training through The School of Natural Healing. Seeking a like-minded community, Paul and Barbi moved to Brattleboro, Vermont in 1986, and prepared their herbal remedies in the back room of a redwood saltbox nestled high in the Black Mountains, a home they still live in today. What began at home soon expanded into larger and larger facilities as the demand for Paul's herbal formulations grew. These formulations were duly recognized as "new chapters" and set the stage for a procession of breakthrough formulations we now know as New Chapter food supplements, including the first line of whole food probiotic nutrients integrated with holistic herbal extracts. Recognizing the tremendous healing potential of ginger in the early 1990s, Paul integrated supercritical extraction technology into a full line of ginger products. By 1994, while combing the globe for a reliable source of organic ginger, Paul partnered with Steven Farrell to found Luna Nueva, the first organic and now Biodynamic blue ring ginger farm in Costa Rica. In 1999 Paul invited his college friend, Tom Newmark, to join him at New Chapter. The partnership has generated pioneering publications, innovative product development and dramatic growth. Today, Paul and Barbi are still pivotal to daily business at New Chapter. Besides serving on executive leadership they each contribute their foundational energies. Paul heads up the Innovation team and continues to inspire the product development and formulations that have made New Chapter the recognized leader in the natural supplements field. Barbi works to enliven and sustain the mission-inspired culture the company has been from the start. As with any dietary or herbal supplement, you should advise your health care practitioner of the use of this product. For use with children, or if you are nursing, pregnant, or considering pregnancy, you should consult your health care practitioner prior to using this product.